Shake-A-Leg Miami has created some really amazing opportunities for people in the yachting world. Sarasota Yacht & Ship along with the Florida Yacht Brokers Association proudly supports the organization in all of their endeavors to advance the lives of those who are disabled, through the marine environment. Their mission is to help children and adults with physical, developmental and economic challenges; liberating them from the realm of imagination into the realm. Over the last 20 years, thousands of children and adults have learned to sail at Shake-A-Leg Miami. Most have disabilities – paraplegia, quadriplegia, blindness, deafness, autism, emotional disabilities and other challenges. Many cannot afford the program so Shake-a-Leg Miami provides services at no charge to them and their families. A woman named Kerry Gruson has become a influential figure in the organization (watch her story here) Kerry found a restored meaning in life at Shake-A-Leg. After learning to sail, she eventually competing against some of the best sailors in the world. 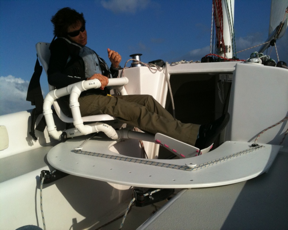 She went on to become a founding member of the Shake-A-Leg Miami Innovations Center team, which is currently working on a seating system for both the helm and crew positions to fit in almost any size cockpit. Because of this organization, people with many different disabilities will have the option to be full participants on many different types of boats, both power and sail, in a safe and effective way. Visit their website to learn more! If you will be attending the Miami Boat Show, Feb 16-20 and would like to participate in an event to help this incredible organization, register to attend the 2nd Annual MIBS Kickoff Party the Wednesday before the show. All proceeds go to Shake-A-Leg.